CINEMATIQ™ is the nations only print publication on the art, culture and business of cinematic portrayals dominated by images of the African Diaspora. This magazine highlights and discusses Black images in all films and their makers. The team is made up of artist, enthusiasts, critics, journalists and scholars of color. Angel Brown independently publishes and distributes CINEMATIQ™﻿﻿ Magazine under BROWN-ROSS Publishing and will soon publish a monthly digital entertainment supplement for current subscribers. The complimentary supplement will highlight new film, web-series, and one feature along with special events and workshops from around the world. In addition to the hard copy and digital supplement, the official CINEMATIQ™ Magazine website, www.cinematiqmag.com will be readily available for up-to-date coverage. The site features, exclusive interviews, articles, profiles, plus CINEMATIQ™’s collection of Photo-Journals from red carpets movie premieres to special events including video clips. The site also has a DVD and VOD library of Black theme classics from yesterday and today. CINEMATIQ™ is a new national film art, culture, and business periodical with a focus on critiques of Black images in cinema and their makers. We aim to create a platform for all minds to be stimulated through thought-provoking articles, interviews and reviews from the distinct perspective of film journalists, critics, renaissance artists of the time and scholar’s of color, helping to balance the world's cinematic view. 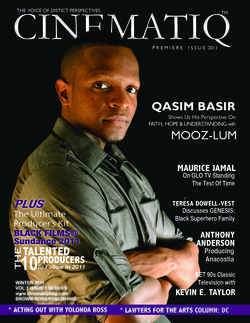 The magazine returns in 2015 with the option of digital subscriptions or single issue prints at www.cinematiqmag.com, online bookstores and select bookstores. All print orders will be mailed to your home or office! If you would like to carry CINEMATIQ™ Magazine in your store, please contact us today! Join the mailing list to get the first preview and updated information.